Grafenwoehr Elementary School presents Annie the Musical. The show is open to the community. Come see the show for yourself on Thu, May 12, at 6:30 p.m. or Fri, May 13, at 1:45 p.m. in the school cafeteria. Photo by Terri Sobey. 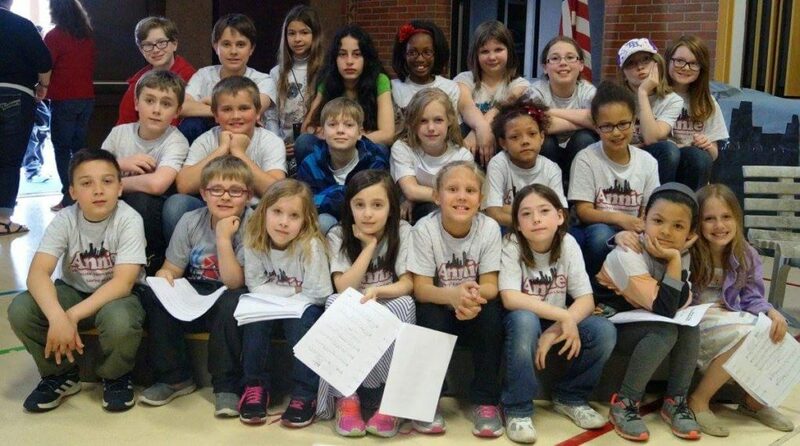 GRAFENWOEHR, Germany — Grafenwoehr Elementary School will host the musical, Annie on Thursday, May 12 at 6:30 p.m.
Each spring, our teachers, Ms. Levison, Ms. Bentley, and Mrs. Sobey organize a musical for the students of Grafenwoehr Elementary School. Auditions are held after school by those teachers. They choose the cast, pick out costumes for every individual and teach songs to all the students in the musical. This is Bella’s second musical at Grafenwoehr Elementary. Last year she was in Aladdin. Ella Scheuermann, another fifth-grade student is performing in this year’s musical. “I auditioned for the musicals because I thought doing them would be fun,” said Ella. Ella, like Bella, has been in other musicals, too. Ella has performed in Aladdin, Aristocats, Jungle Book, and now Annie. These musicals are part of Grafenwoehr Elementary School and everyone looks forward to spring when they get to perform or watch an amazing show. The directors do a fabulous job of teaching students how to act confident on stage and to speak loudly so everyone in the audience can hear everyone’s amazing voice. These are skills that can be used throughout life and not just on state. The Grafenwoehr teachers use their time to put together an experience of a lifetime for the students at Grafenwoehr Elementary School. The show is open to the community. Come see the show for yourself on Thu, May 12, at 6:30 p.m. or Fri, May 13, at 1:45 p.m. in the school cafeteria.